Click here for more details and to register by May 14 (or until full). Why Should I Renew Early? Back to school time can be hectic as everyone adjusts to new schedules and activities. 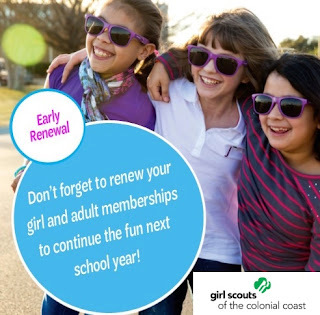 By renewing your Girl Scout membership now, you'll have one less things to worry about when September comes around. The process is quick and easy so why not take a few minutes today and have one less thing on your to-do list this fall? Renewing your membership now may seem like a small thing but the impact is huge! Not only is it the first step to another year of life changing adventures, there are fun perks for both girls and troops. So whether you are enticed by the early renewal incentives (stay tuned for big news regarding May incentives) or just want to get a head start on next year, consider renewing your membership today! 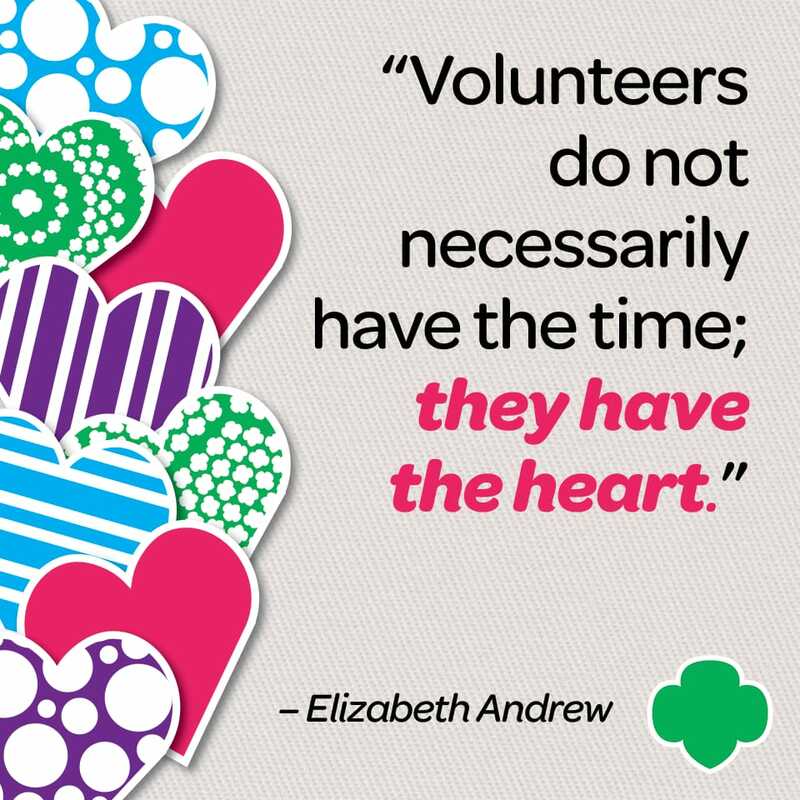 Thank you Girl Scout Volunteers for All That You Do! We cannot express our gratitude enough for all that you do to serve girls throughout our council. You are the core of our Movement because you work with girls every day to help give them courage to try new things and pursue their dreams in ways that they never imagined. Because of you, girls are growing into confident young women who change the world...girls who will be leaders in their communities. Thank you for inspiring generations of girls and women! Do you want to kick off your 2018/2019 Girl Scout year with a super fun event hosted by the Council? That's why we've saved the best for last for April Early Renewal incentives. All troops that have a minimum of 90% of their girls (and two adults) renewed by April 30, 2018, will be invited to a special Back to School/Back to Troop Event taking place on September 15, 2018. Your troop won't want to miss this event, so make sure to get your girls renewed by April 30. Qualifying troops will receive their invitation and registration information the week of April 30. First five customers, daily at each location, receive a 20 percent discount off entire purchase. Remaining customers receive a 15 percent discount off entire purchase. While supplies last. In-stock items only. Cannot be combined with any other offer. Receive a 15 percent discount off entire purchase when you show your Active Duty or Retired Military ID card. Cannot be combined with any other offer. Show your Girl Scout spirit at your high school graduation by wearing a Girl Scout stole, a Girl Scout tassel or green and white cords. Orders must be placed no later than May 25, 2018. Click here for ordering information and photos of regalia items. Girl Scout voices count, and time is running out! Girl Scout voices count, and time is running out! Don’t miss the chance to share your thoughts on Girl Scouting. With your feedback, we can learn, grow, and make Girl Scouts better than ever. 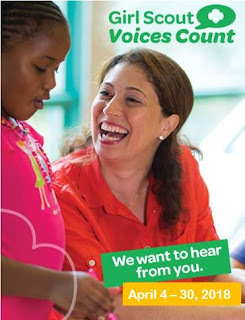 Check your email for a personal invite to the Girl Scout Voices Count survey and share your thoughts. But don’t miss out – the survey closes April 30! As a Thank You, everyone who completes the survey will be entered into a raffle to win one of twenty $50 gift cards! We can’t wait for you to make your voice count! FREE family event. Refreshments will be served. Open to all age levels. OBX Lizard Land is a family-friendly reptile education center featuring many exotic species of reptiles from around the world. Come get an up-close and personal look at some of the globe's wonderful animals. RSVP to info@currituckchamber.org for serving purposes. Cost: $12 per participant (includes event patch). This is a family event. All must pay to attend. 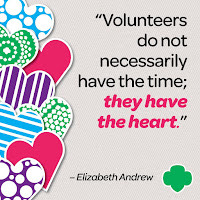 Girl Scouts is celebrating our amazing volunteers with a sweepstakes hosted by JOANN via Quikly! Participants can win up to a $500 gift card to JOANN stores, and those who enter can increase their odds of winning by completing simple actions, like posting on Instagram about their favorite volunteer. The sweepstakes launches April 12 and will run through April 22, which is Girl Scout Leader’s Day. Find out more and enter today! 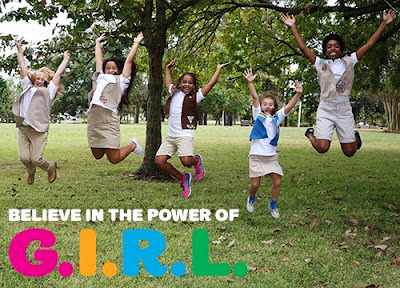 Girl Scouts has been working with JOANN since September 2017 on such unique opportunities as the Girl Scout Rewards Card and fun craft activities and events. We look forward to continuing to bring exciting opportunities to our Movement through this collaboration. Early Renewal is Officially Underway! Troop Leaders - Now is a great time to register your troop for next year! Not only will each of your girls receive an Early Bird patch, you'll be ahead of the game for this fall. You may also be eligible for a number of additional early renewal incentives. All troops who register 90% of their girls AND two adults by April 16, 2018, will receive a $30 coupon* for the Council retail shop. *Coupons will be mailed out by April 20, 2018, and must be redeemed by May 31, 2018. Your voice counts! Girl Scout Voices Count survey is here! We care about your experience, good or bad, and we want to hear from you! Girl Scouts of the USA is conducting a national survey with girls, parents/guardians, and troop volunteers called Girl Scout Voices Count to find out what’s working, and what’s not, in Girl Scouts. We will use your feedback to improve our services and programs. Check your email for the invitation to participate. As a Thank You, everyone who completes the survey will be entered into a raffle to win one of twenty $50 gift cards! We can’t wait for you to make your voice count! Please note that the retail shop hours for the Chesapeake shop are changing beginning this month. The Chesapeake retail shop location will resume Saturday hours until the second Saturday in June, on June 9, 2018. Retail shop location hours are as follows. Start your journey as an adult learning facilitator after taking this course. Register on eBiz by April 30. Register on eBiz by April 24. Girl Scout Seniors and Ambassadors only. Register on eBiz by April 11. Cost: $3 and a donated unused/new school supply item(s) to benefit Troop 916's Global Action Award. Participation includes a Mambo Room dance patch! No tagalong and adult ratio will be required. Girl Scout Troop 916 of Service Unit 350 invites Girl Scouts to their Girl Scouts Dancing with the Stars: Merengue & Salsa event. Questions? Contact gscctroop916@gmail.com or (text only) to Jeannette at 808-282-4472. Operation Homefront is seeking volunteers (girls ages 14 and up, and adults). It's time for our next Star Spangled Baby Shower in Hampton Roads to support new and expecting military moms and we need your help! Volunteer dates are below and times are mostly flexible. Tuesday, April 10, 2018, 10 a.m.-2 p.m.
Saturday, April 14, 2018, 10 a.m.-2 p.m.
Saturday, April 21, 2018, 10 a.m.-2 p.m.
Wednesday, April 25, 2018, 10-11 a.m.
Wednesday, April 25, 2018, Noon-4 p.m.
Thursday, April 26, 2018, 8 a.m.-2 p.m. Specific location information, including address, will be given to those who RSVP. If you are interested in volunteering, email Program Coordinator Shannon Stinson at shannon.stinson@operationhomefront.org. Check out these upcoming events from our Community Partners! These events are great for newly added girls or busy troops. Open to girls ages 8 and up, and adults. Have your troop/group meeting at any Skinny Dip Frozen Yogurt store in Hampton Roads and earn a patch! View this flyer for more details and to schedule a tour. Come visit the environmental fair to gain knowledge from educational booths and meet environmental educators. This is a Girl Scout Gold Award Project by Ambassador Nicole. Show the World Your Cookie-Selling Savvy! 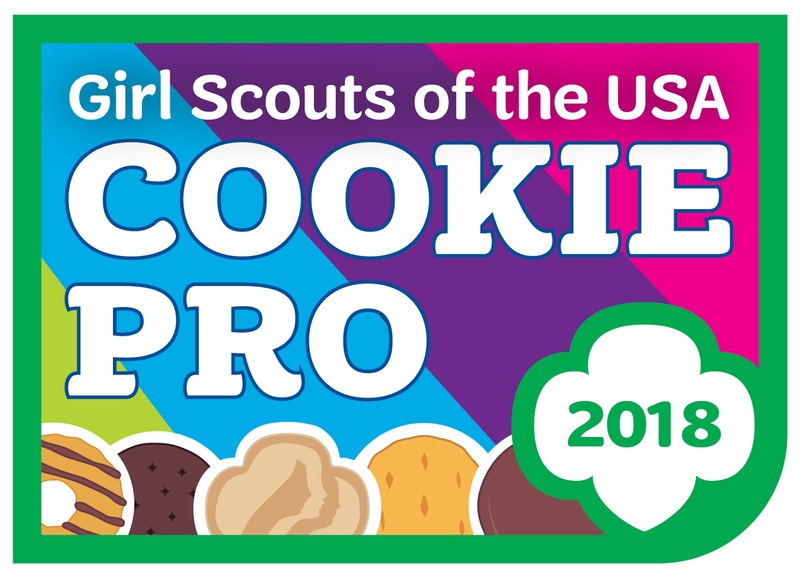 This cookie season, SIX girls nationwide, one per Girl Scout grade level, will be named GSUSA's Top Cookie Pro 2018 and get the EPIC chance to be featured on the Girl Scout Cookie box and travel to New York City for an all-expense paid Girl Scout Cookie Entrepreneur Experience. Best-selling tips for crushing cookie sale goals like a PRO! To submit your entry, visit https://www.girlscouts.org/cookiepro. It's time for another wonderful Girl Scout year with renewal. Troops and individual members can take action today and renew their membership. The Council is offering girls, troops and service units some great renewal rewards to show our appreciation! All girls who register by 11:59 p.m. on Monday, April 2, will receive the 2019 First Day Patch. Check out the incentive flyer for all April incentives. Draw an egg at checkout and receive a 5 percent, 10 percent, 15 percent or 20 percent discount off your entire purchase. May not be combined with any other offer. Receive a 15 percent discount off your entire purchase including bridging supplies. Leaders will receive a special volunteer fun patch! While supplies last! In-stock merchandise only. Cannot be combined with any other offer.